Grill'd is a chain of hamburger cafes with 14 stores throughout Perth and surrounds. Their hamburgers are advertised as "healthy" hamburgers, and their menu is quite extensive. I have been to one in Mt Lawley and I went to the one in Cottesloe this time. Although it was a fairly dark place, it was comfortable, and the hamburgers were very tasty, and it took me a while to decide which one to have. They make the food behind the counter so it is possible to see what they are doing all the time, which is definitely a plus. It would seat about 50 people, though was not at all crowded when I was there (it was miserable weather). It is an "order and pay at the counter" service, and they bring the HUGE hamburger to your table. 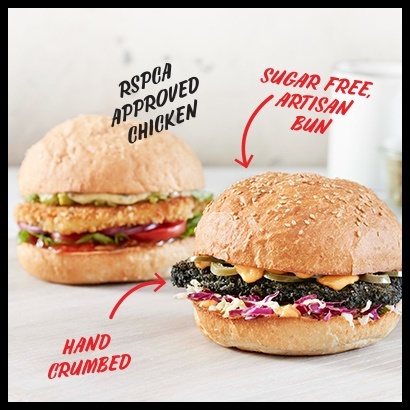 On this occasion, I chose a chicken with bacon (well done, of course), avocado, relish, herbed mayonnaise and salad, and this was called the Simon Says burger. Their menu is mainly burgers with steak sandwiches, sliders, and a variety of hot chips, and they also do three veggie burgers. Kids are also catered for with a few smaller packs, and their prices are very reasonable with mine being $14, and the beef burgers being mostly $1 more, at $15. Their artisan buns are sugar and preservative free and you have a choice of a panini or traditional roll. They are also gluten free, and their menu shows which fillings are gluten-free. They are currently running a promotion called Local Matters, whereby when you order, you get an envelope with a token in it. There are three bottles near the entrance and you put your token into one of three bottles; each is marked with a different charity. At the end of the month, the charity with the most tokens receives $300 and the other two get $100 each. Their motto is 100% Australian born and bred and made with love., and they are situated at 6 Napoleon Street in Cottesloe (near the railway line). A great place for a casual, quick meal, which will leave you feeling like you have had an "eloquent sufficiency"! Check out their menu here, and their website here.